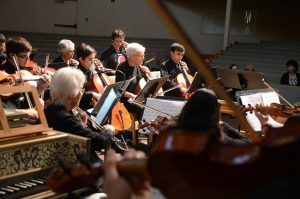 On Sunday, April 23 at 3:30pm, The Chamber Players of Palm Coast, under the direction of Paige Dashner Long, will present a concert at Palm Coast United Methodist Church, performing works by Gluck, Abel, Bach, and Handel. This concert will also include a special appearance by the Harmony Chamber Orchestra, the advanced orchestra from the Flagler Youth Orchestra Program, directed by Sue Cryan. They will play one piece at the beginning of the concert and join together at the end of the concert to perform a well known, majestic piece by Handel and a fugue. The April 23rd concert will feature violinists Sue Cryan as concertmaster, Dorothy Barrett, Penny Crouch, El Gervasio, Martha Delaney-Hotz, Daniel Masbad, Chris Romaine, and Maggie Snively; violists Karen Hacker and Phil Pearson; cellos Joe Corporon and Sandy Pearson; flutes Wendy Gill and Paige Long, also playing harpsichord. The concert is free and open to all. Invite family and friends. Palm Coast United Methodist Church is located at 5200 Belle Terre Parkway. For more details, call 386-445-1600.